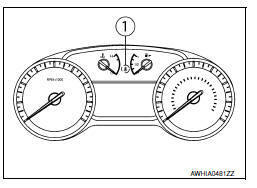 The air bag deploys if the air bag diagnosis sensor unit is activated while the ignition switch is in the ON or START position. The collision modes for which supplemental restraint systems are activated are different among the SRS systems. For example, the driver air bag module, front passenger air bag module and front seat belt pre-tensioners are activated in a frontal collision but not in a side collision. The occupant classification system (OCS) identifies different size occupants, out of position occupants, and detects if a child seat is present in the front passenger seat. 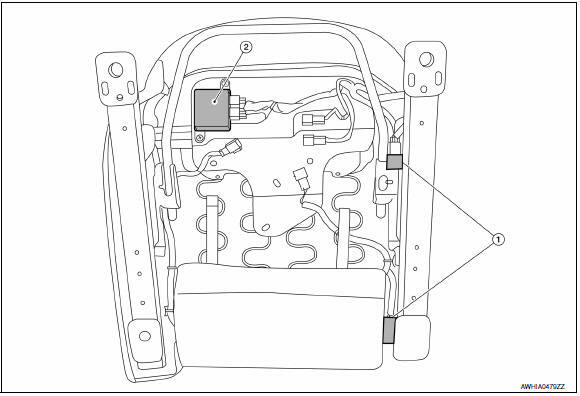 The OCS control unit (2) receives inputs from the occupant classification sensors (1) (located inside the passenger seat cushion assembly). 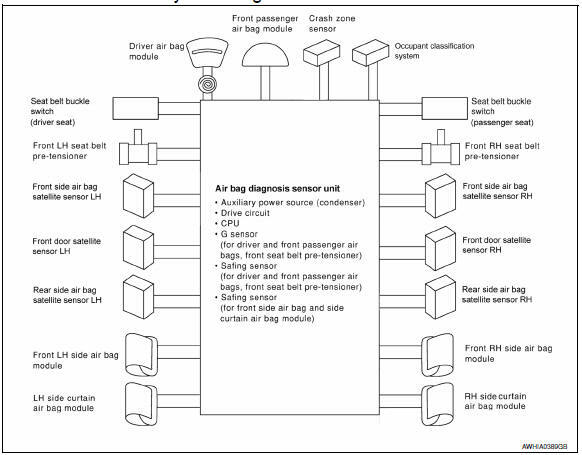 Depending on classification of the passenger, the OCS sends a signal to the air bag diagnosis sensor unit. The air bag diagnosis sensor unit uses this signal and the seat belt buckle switch (passenger seat) signal to determine deployment or non deployment of the passenger front air bag in the event of a collision. Depending on the signals received, the air bag diagnosis sensor unit can disable the passenger front air bag completely. The OCS (weight sensors) must be set to zero point using CONSULT after servicing the OCS system. Always perform zero point reset after the removal and installation of the seat or when disconnecting the OCS control unit harness connector even if zero point reset has been completed in the past. If zero point reset is incomplete, the passenger air bag will be disabled and the passenger air bag off indicator will be ON. In case of customer concern, CONSULT can be used to confirm the passenger air bag status (readiness). Passenger does not meet Occupant Classification System specifications for passenger air bag activation. The seat belt warning lamp (1) will remind the driver if the driver or front passenger (US/CAN models) seat belt should be buckled. The system works in conjunction with the occupant classification system. Refer to SRC-12, "OCCUPANT CLASSIFICATION SYSTEM : System Description".